Love a story about a man and his dog and Slade and Lola fit the bill to a “T”. Lieutenant Lola, was a bomb sniffing dog in the military and Slade was her handler. She has now been retrained to help Slade with his PTSD and Lola is the only woman he needs, that is until he meets the feisty, Taylor. Slade has been left in charge of Deep Six Security and his first order of business is to hire more help, along with keeping their biggest client, when things go south with the kidnapping of the client’s son. Taylor is head of security at the hotel where things go wrong and she gets fired over the incident. Slade brings her into Deep Six, but finds she may have more problems than he has. Throw in her dog Buddy, a misfit Labrador, hit men, alpha egos, ransom demands and twists and turns that keep you turning the pages. Love the men and women of Deep Six and only Becky McGraw could do them justice with her character development and well written stories. She has added romance, strong women, alpha men, humor and furry companions that keep you wanting more. I especially like the epilogue which is given from a “furry” point of view. Can’t wait to read the next installment in this series. Kudos to Ms. McGraw on another winner. Received copy from author for an honest review. 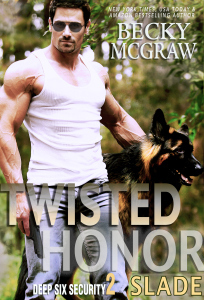 This entry was posted in Military Romance, New Releases and tagged Contemporary, Military, Morgan's Musings, New Release. Bookmark the permalink.